The document, first leaked onto the Chinese internet, explains a program for residents to form “10-household anti-terrorist units.” Each member is equipped with a large wooden stick, whistle, and one-button alarm. In case a riot breaks out, members are required to press the alarm—which can be mounted on the wall or carried anywhere—immediately, which notifies the authorities. Then, they blow their whistle to inform other members, and grab their sticks to attack any so-called “terrorists” they encounter. The notice gives tips on how to strike effectively, noting that members can even beat the “terrorists” to death, without having to bear any legal consequences. 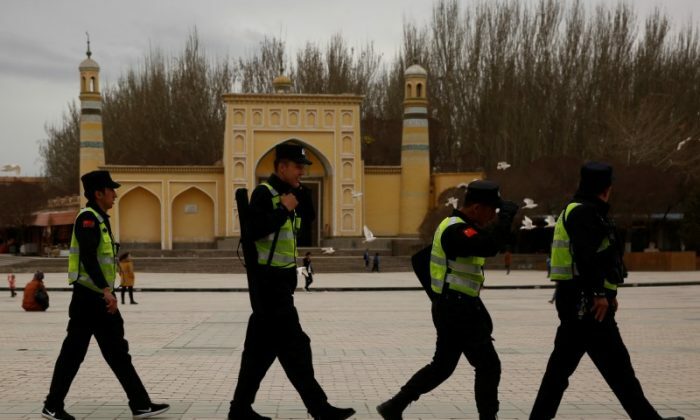 Xinjiang, home to many Muslim minorities including Uyghurs and Kazakhs, has been subject to heavy surveillance since July 2009, when riots in Urumqi turned deadly. Since then, the Chinese regime has labeled Uyghurs a terror threat, justifying the severe suppression of the population as anti-terror measures, including banning students from speaking Uyghur in schools, burning religious books, and throwing Uyghurs into concentration camps. According to reports on China Peace, an online media run by the Chinese Communist Party’s Political and Legal Affairs Committee (PLAC), the “10-household” program has existed since at least August 2014, deployed in different parts of Xinjiang. The PLAC oversees China’s entire security apparatus. In an April 11 interview with Radio Free Asia, a Kazakh resident in Ili Prefecture in northern Xinjiang said that local authorities often conduct alarm exercises. Those who are late three times, or fail to memorize the contents of a brochure containing the same information as the leaked notice mentioned above on 10 occasions, will be sent to concentration camps, he said. He learned that in the local counties of Yining and Altay, and the neighboring county of Emin, barbershops have had to suspend operations during the drills because there is only one barber working at the shop. Others have had to run out while in the middle of cutting a customer’s hair. Dilxat Raxit, spokesperson for the World Uyghur Congress, an international group representing exiled Uyghurs, told the Chinese-language Epoch Times on April 12 that the “10-household” program is a mechanism for Uyghurs to inform on each other, because if there is an “extremist” in one household, the other nine households will be implicated and sent to concentration camps. Raxit also pointed out that some Chinese high-technology companies are assisting the Chinese regime in its surveillance of Uyghurs. For instance, Radio Free Asia found that the Shenzhen Security Group explained on its website that its one-key alarm product is used for the 10-household program. Raxit called on the international community to impose sanctions on Beijing, and to punish tech firms that assist the Chinese regime in carrying out their persecution of Uyghurs.